There are cars and then there are special cars. After quite a long time, Maruti Suzuki has relased a very special car, a true inspiration. The new Nexa Ciaz is beautiful, it’s a great performer and last but not the least, it’s extremely charming and elegant. A true delight for car lovers, this new avatar of the Nexa Ciaz is simply irresistible. In this detailed review, we will tell you about its new design, its new features, its new engine and more. So get ready to find out why the 2018 Maruti Suzuki Ciaz Facelift simply outperforms its rivals. For all of you out there, who love experimenting, the sharpness of the Ciaz 2018 will simply blow your mind. The elegant front grille with chrome accents gives it a very sharp look, which is perfectly complemented by the LED projector autoheadlamps. These headlamps were never seen before in this segment, so it’s a significant fast in the 2018 Maruti Suzuki Ciaz Facelift. These LED DRLs gives the all-new Ciaz a cool “look me in the eye” attitude, which adds on to the style quotient. Next are the alloy wheels, which are a class apart. The 12 spoke machined alloy wheels come with a gorgeous metallic grey finish. It is chic and contemporary, perfectly aligned with your style. Why the 2018 Maruti Suzuki Ciaz Facelift beats its rivals by a mile? When the Maruti Ciaz first came into the market, it dominated the sedan segment and quickly became everyone’s favourite. It is worth mentioning here that the market previously was dominated by Honda City and the car didn’t have a true challenger. But in the year of 2014, Ciaz came with a bang and till date, 2.2 lakh units were sold by Maruti Suzuki. There were many competitors like Hyundai Verna, Skoda rapid and Volkswagen Vento, but nothing could come near the sales figures of the Ciaz. When compared with the Toyota Yaris, the Ciaz looks much better with its sharp styling and premium looks. Next up is the glamorous Hyundai Verna and its signature cascading grille gives it a very bold look. However, the Ciaz facelift beats its rivals comprehensively in the performance department. The 1.5-litre K-Series petrol engine is perhaps the biggest update. This engine can consume 13% more power, thereby significantly boosting the performance. Now the price aspect can’t be ignored, while buying a car and you should do your comparison really well. The on-road price of the Toyota Yaris indicated that it is a bit on the costlier side. 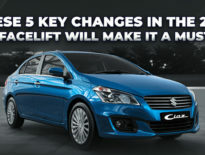 Along with the Verna, the Ciaz comes under the same price range. It is packed with amazing features, but it is not extremely expensive. As far as on-paper analysis is concerned, new Ciaz is a clear winner. Extremely fuel-efficient, loaded with premium features and very spacious, the 2018 Maruti Suzuki Ciaz Facelift is the car you should own this year. Created to inspire, this is the car which is destined to rule the market in the days to come. So, now that you have all the information that you need. Get your all new Ciaz from Nexa Premsons today, call us now: 09608800400.